Broccoli and cauliflower take on a whole new identity when cooked with high heat and only a little olive oil and seasoning. Nutrition Highlights: Broccoli and cauliflower are rich in potassium, fiber, Vitamin A, C, K and antioxidants. In season from January through May, broccoli is the perfect addition to your springtime menu. 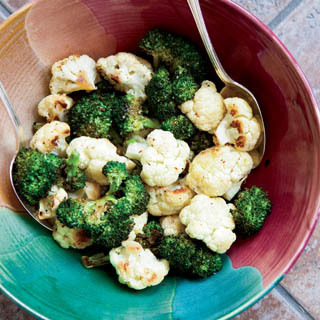 Toss broccoli and cauliflower in a large bowl with olive oil, salt and black pepper. Add garlic and crushed red pepper; toss well to thoroughly coat all pieces. Coat a shallow baking pan (10x15x1-inch jelly roll pan) with cooking spray and arrange vegetables in single layer. Roast 10 to 15 minutes or until slightly tender and beginning to brown but not burn. Stir all vegetables once during cooking time. Serve immediately. This recipe also works for roasting brussels sprouts. Replace the broccoli and cauliflower with 1½ to 1¾ pounds fresh Brussels sprouts, brown ends trimmed and yellow leaves removed, then toss with olive oil, salt and black pepper (no garlic or red pepper). Increase roasting time to 25 to 30 minutes or until sprouts are tender inside and slightly crispy on the outside. Another substitution idea: Sweet potatoes or any winter squash. Simply roast seasoned sweet potato wedges or winter squash halves for 30 to 50 minutes or until soft and fork-tender. I made this today with cauliflower and broccoli I just harvested from my garden. 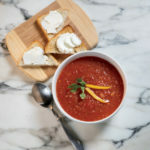 Instead of using store bought red pepper flakes I used my own red peppers I grew and dried. I just broke them up and added to mixture. It came out so good.I will be making this many times. I am also using part of this in a rice , smoked sausage dish I am experimenting with. Add in some pine nuts and small capers for an even better dish!